I recently wrote a piece for moleskinerie. It has been published today. It's reproduced below. I like gadgets. It's a weakness. If it has buttons, or even better, lights - then I'm hooked. I've wanted a GPS for some time, mostly for the geek value - it's true. So, I began to look for ways to justify the cost, and I discovered Geocaching. Geocaching started just a few years ago (when Bill Clinton switched off the 'Selective Availability' which meant that GPS systems had accuracy of a few hundred metres), and has since grown into a worldwide sport. With a good GPS signal, your location on Earth can be known to within a few metres. In the simplest form, someone hides a geocache. Someone else finds them. The caches could be hidden out in the countryside, or hidden (discretely) in a city centre. Just the other day I went into London and found 13 caches, some in very well trafficked areas. Caches can be more complex, in a multistage cache a series of clues need to be solved to discover the final location - and in a mystery cache research may be needed before you even walk out of the door! When a cache is found, the finder writes in the log to claim a visit, replaces the cache and moves on. As caches are often (but not always) placed in interesting spots, I\'ve found that since starting to cache I've discovered places locally that I never knew existed. Geocaching provides me with a 'purpose' to a walk - a definite target, and it helps to keep each walk unique. Where do the moleskines come in? When I started I decided to keep a personal log. In the log I record the cache name, coordinates, and any other piece of information. This may be a hint to the location, so that I can help anyone who gets stuck that follows, it might be a note about the weather. When I get home I log my finds on the geocaching website. Another feature of geocaching is the gift. Many caches contain 'goodies' - these are usually small items. The rule of thumb is that for everything taken out, something else goes in. One common type of item is the travelbug. 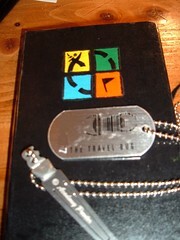 A travelbug is a trackable item with a unique serial number. When at a computer, the item can be logged independently and it can be tracked in it's travels. The number should not be revealed online, as it is evidence that the bug has been found. Travelbugs should be placed in a new cache within 2 weeks, and not taken unless this can be done. I wanted to launch a travelbug (I now have seven out in the wilds) - and my first travelbug? A moleskine, my own 'wandering art project'. I launched it by putting it in a newly placed local cache, after preparing it well. Inside the cover are instructions about what the travelbug is, and about it's mission. The future? I've found 65 caches in total, and am heading for 100. I'm currently looking into paperless caching (so there is less printing out before I head off on a walk, I could take the gps and pda, and off I go). 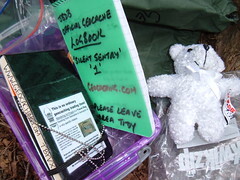 Even if I do make the leap to paperless caching, my moleskine log will stay with me to record the results of my finds. Newer PostRSS - Live it, use it, love it!